In 2009, Joyce Ashuntantang published a book titled Landscaping Postcoloniality: The Dissemination of Anglophone Cameroon Literature which Bernth Lindfors describes as the “most comprehensive study of Anglophone Cameroon literature that has been published to date”. 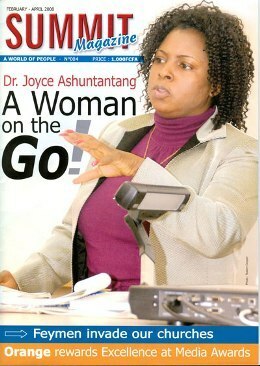 In the book, Dr. Ashuntantang, who teaches literature at Hillyer College, University of Hartford, USA, demonstrates that contrary to widespread belief, literature from the English-speaking part of Cameroon is alive and well, in spite of a host of obstacles that have slowed its development and reduced its international visibility. In this interview, Dr. Ashuntantang discusses her ground-breaking book and the state of Anglophone Cameroon literature with Dibussi Tande. DT: To the man in the street, a viable literature is one that produces many books and has writers of repute. Rarely does dissemination enter into the equation. Can you explain why/ how dissemination is equally, if not more important, in assessing the viability of a national literature? JA: It is not that dissemination is more important in assessing the viability of national literature. The point I make in my book is that the way a book is disseminated influences the way it is received by readers. For example, African literary works published by multinational companies are disseminated internationally and so the works also receive international acclaim, while works that are published and disseminated locally do not get known widely no matter how good they are. If dissemination is the key to the development and sustainability of a literature, can we really argue as you have done that Anglophone literature is vibrant? Yes it is vibrant. The point I make is that while judging African literature, we should not only look at works that are coming out of international distribution channels. As Buma Kor puts it “ the way to know about all the literature of Africa is to know the different writings from different parts of Africa, the distinctive characteristics embodied in all writings from country to country or region to region. It is not grouping them together, but singling them out, analyzing the different themes problems, styles, messages”. In a recent interview, novelist Patrice Nganang argued that Cameroonian literature does not belong to Cameroonians because the copyrights to major Cameroonian literary works are owned by European and American publishers. He adds that we cannot develop a sustainable literature which serves as the foundation of our collective memory under these circumstances. Is this also your view? Certainly. The problem even goes beyond copyrights. As long as foreign publishers remain the mid-wives of our stories, they will keep determining the nature of these stories. What then is the role of Cameroonian publishers such as Editions Cle, Patron Publishers, and Langaa in this regard? Will the problem of sustainability and (re)appropriation of our literature be resolved by simply having more Cameroonian authors publishing locally or through partnerships between local and foreign publishers? Of course, no one is an island – a viable partnership is the way forward. Local publishers have to network with foreign publishers for wider distribution. For example, Langaa has networked with Africa Book Collective, so works published by Langaa are distributed in the USA by Michigan State University Press and in the UK by Africa Book Collective. What role can an English language university such as the University of Buea play in ensuring that literary works by Anglophone Cameroonians become part of our collective memory, our literary consciousness? I have proposed that the University of Buea library should become a depositary/archive for Anglophone Cameroon literature. You know, the University of Buea provides an all-Anglophone academic environment which engenders a sense of identity. Buea itself is quite a historic town as the capital of former Southern Cameroon and is considered the unofficial capital of Anglophone Cameroons. The Government Archives in Buea could also perform this role, but it is expected that a university archive will be relatively free from Government bureaucracy and the vagaries of national politics. In your book, you argue that “Anglophone Cameroon publishers do not treat books as commercial commodities”. What exactly do you mean by this? Books are meant to be sold and if publishers expect to make this business lucrative, then they have to put marketing strategies in place. In fact, before delving into publishing, publishers must at least investigate their immediate market to determine the size of their audience. They have to determine their distribution chain to work out in advance the publicity strategy for their commodity. Publishers must attempt to determine where their potential readers are located and put the books within their reach. For example, Cyprian Ekwensi argues that “Our culture recognizes retailing as hawking. If that will be the final answer to making our people read more books, then books must be hawked”. You also highlight the disconnect between writers, booksellers and the reading public, which further hampers the availability and dissemination of published works in Anglophone Cameroon. Is there a feasible solution to this problem? The solution is cooperation between the writers, booksellers and readers. Booksellers and readers are important elements of the book chain. Therefore there has to be a thriving relationship between these two. Booksellers are established intermediaries through which readers can get the books they desire. In order to boost reading, booksellers must publicize the materials they own and stocking items readers are interested in. In Cameroon where writers usually fund their own publishing ventures, they have to assist the booksellers in initiating this publicity. You seem to place high value on an author’s manuscript, although the layman’s view is that a published work is much more important than the manuscript on which it is based. What exactly is the literary value of a manuscript when the work is already published? You see, written literature depends on effective record keeping. Literary texts and biographical information need to be preserved not only to keep the text for posterity but to help in reconstructing accurate editions of texts and literary biographies. For example, fifty years from now, when scholars are attempting to edit the complete works of Bate Besong they will find it extremely difficult to establish accurate texts for Beast of Nation, (just one example of his published work with a number of typographical errors) if none of the author’s manuscript and none of the publisher’s proofs are available for study. In my book I give the example on page 19 of Beast of No Nation, some copies have “Agbada go crisis come” while others have “Agbada go trouble come”. “Crisis” and “Trouble” are similar but their connotations are different. Which is the authentic version? Did the writer change it during another print run or is it an error from the publisher’s end? These are interesting questions that can only be answered with the help of a manuscript or publisher’s proof. One of the most fascinating sections of your work is the chapter that deals with literary canonization in Anglophone African literature. Can you shed light on what you mean by canonization? Literary Canonization is the process by which some works are selected and preferred, while others are marginalized and neglected. My argument is that the way Things Fall Apart, the first modern African literary text was published and disseminated pretty much established the dissemination pattern for African literature. In fact this novel shaped the criteria used in judging” worthy” texts of African literature as a whole. In your work you explain that Heinemann’s African Writers Series and its pioneer editor, Chinua Achebe, were instrumental in determining which books became part of the African literary canon, and that these books and authors still hold sway over African literature in spite of the emergence of second and third generation writers who are as good as, and if not better, than many of the first generation writers. Is it possible to rewrite or redefine the canon of African literature to accommodate later generations of African writers? The canon is slowly changing. At least it now includes African women writers like Buchi Emecheta, Tsi-Tsi Dangaremgba, Assia Djebar to name a few, and of course some younger writers like Chimamanda Adichie are being read, but you must understand that African literature is also trapped in the same postcolonial web like African nations. So the strings that control canon formation in African literature are controlled from the west and it will take more than publishers or authors to influence an effective shift. What do you make of the news that Penguin will launch the Penguin African Writers’ Series in August 2009 with Chinua Achebe as its Editorial Adviser, and that the series inaugural six books will include Achebe’s Girls at War and Ngugi wa Thiong’o’s Weep Not, Child? Isn’t history repeating itself all over at the expense of newer writers? Well History may be repeating itself, but I will use King Solomon’s wisdom here not to divide the child and kill it. Any opportunity to showcase African literature is welcomed. The idea behind Penguin’s project is to re-publish the African Literature classics originally published by Heinemann. Some of these works have been out of print for so long and I welcome any opportunity that makes them available in book stores. The problems of publishing and dissemination of African literature run deep and will not be solved if Penguin were to scrap this project. Achebe is going to be an Editorial adviser, but I believe he will be working with younger editors. However I applaud Achebe’s appointment because he more than any other African, understands the politics that control writing. If you read his essays collected in Morning Yet on Creation Day, Hopes and impediments and Home and Exile, you will find that these essays still frame African literature even in the context of today. I had the rare opportunity to interview Achebe last year on the 50th anniversary of his classic, Things Fall apart and this living legend still exudes wisdom in a prophetic manner. A lot has been written and said about the negative role that western publishers have played in stifling African literature or alienating it from the people. Isn’t it possible to make the argument that the African/Cameroonian state has played an equally nefarious role by ignoring that literature, keeping it off the streets, and locking it up within what poet Kangsen Wakai has described as the “tyrannical walls of academia”? The fact that African literature is tied to academia is not limited to Africa or Cameroon. However the way African readers associate African literature with school examinations goes back to the fact they were introduced to this literature in the classroom. My research on Cameroon literature documented in my book shows that most readers out of school indicate an interest in popular literature, therefore Anglophone Cameroon writers have to write for this group of readers to balance the types of books available for reading. It is true there has always been a debate whether low brow literature should be encouraged, but research in many countries has shown that only 10 percent of all adults read serious literature. In April 2009, the University of Yaounde hosted what was arguably the most important conference on Cameroon literature in over two decades. One striking aspect of the conference was a complete absence of discussions and papers on Cameroon Anglophone literature in the Diaspora. Doesn’t this prove that claims of the vibrancy of Anglophone Cameroon Literature in the Diaspora are highly exaggerated? Can a literature that is unknown or shunned be considered vibrant? Well, it was not a total absence because there was a paper by Babila Mutia on two short stories by Makuchi; The Healer and Your Madness, Not Mine. Anyway, I don’t think writing from the Diaspora is shunned. The works are simply not available in Cameroon or are not known. Take for example Makuchi’s fascinating collection of short stories, Your Madness, Not Mine: Stories of Cameroon. This work is not available in Cameroon and I bet you Professor Mutia must have picked up a copy of this work during one of his visits to the USA. Also take the more than fifty works published by Langaa; these are not yet available in Cameroon in bookstores because Langaa prints out of Cameroon. I know this is a problem Langaa hopes to rectify soon and once this is done, Cameroonians in Cameroon can start reading and critiquing these works. Back to the issue of sustainability and collective memory. The poet Wirndzerem Barfee has lamented that in Cameroon, writers are not accorded the same status and even privileges like footballers (medals, financial incentives, audiences with the head of state after international awards, etc.). Patrice Nganang, on the other hand, sees no problem with this, arguing that unlike football, literature does not need instant and ephemeral adulation and an obsessive presence on TV because sustaining and developing a literature is a long term intellectual endeavor. What is your own take on this? I believe that medals, financial incentives and public recognition in themselves do not make a writer or keep his name for posterity; however, these are all aspects that help to sell books. If a writer is visible in the public eye most likely his works will be visible too. Visibility is the stuff on which the canon feeds. I don’t believe so. Understanding Anglophone Cameroon literature only helps in understanding Cameroon literature as a whole. According to that argument, we may as well just talk of African literature and no Cameroon or Nigerian literature. Today we hear of Yoruba studies or Igbo studies, so how do these hinder Nigerian or African studies? Whenever someone tries to suppress another person’s identity for whatever reason I become highly suspicious.